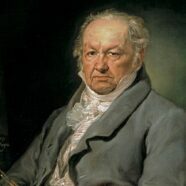 Francesco Goya was a Spanish painter and portraitist whose career reached its peak in the late eighteenth century. He was a contemporary of another painter, a British one, Joseph Wright of Derby. Another British artist you might have heard of is Mick Jagger and despite what some of you think, Wright and Jagger were not contemporaries. However, one of Wright’s most famous paintings is called An Experiment with a Bird in the Air Pump. Now, you might have heard of the word “pastiche” and in case you haven’t I tell you what it is: it’s a work of art by one artist that closely resembles that of another’s, but in a respectful way – this differentiates it from a parody. The Rolling Stones’ 2005 album, A Bigger Bang, features as its cover a portrait of the band but with strong resemblances of Wright’s aforementioned painting. On that album is a song called Back of my Hand. It’s a song about a clairvoyant, a visionary who can “read [the future] like the back of [his] hand” but specifically he see “paranoias” and, yep, you’ve guessed it – Goyas, that it is to say, paintings by Francesco Goya.